Cerebrotendinous xanthomatosis is a rare genetic metabolic disorder of cholesterol and bile acid metabolism that results in systemic and neurologic abnormalities. We report two cases of bilateral painful enlargement of the Achilles tendons who subsequently were diagnosed with cerebrotendinous xanthomatosis. It is important that orthopaedic surgeons be aware of this condition because the initial presentation may be symmetric, painful enlargement and deformity of the Achilles tendons. Early diagnosis is the key to treatment because medical therapy is effective in halting progression of, although not reversing, the devastating neurological lesions of this condition. Keywords: Xanthomatosis; ataxia; Achilles tendon; genetic disorder; early diagnosis. Registrar Hospital for Bone and Joint Surgery Barzulla Srinagar Kashmir India. Cerebrotendinous xanthomatosis (CTX) is a rare autosomal recessive lipid-storage disease secondary to a disruption in cholesterol metabolism caused by a mutation in the sterol 27-hydroxylase (CYP27) gene [1,2]. In the absence of the key enzyme, sterol 27-hydroxylase, other metabolites are increased such as cholestanol. This elevated concentration results in characteristic clinical findings such as bilateral cataracts, tendon xanthomas, and neurologic impairments including debilitating cerebellar ataxia and cerebral degeneration. A 27-year-old male presented to our hospital with a four-year history of bilateral, slowly progressive, painful swelling of the Achilles tendon, but showed rapid progression in size for last 3 months to the extent that it interfered with his ability to walk. The pain was exacerbated by walking, was relieved somewhat by rest, and progressively restricted the patient’s walking distance to a maximum of two blocks at present. The patient had been previously operated on for bilateral cataracts thirteen years before. No other family members have shown similar symptoms or signs of hypercholesterolemia. On physical exam, each fusiform mass measured 10 cm in length starting approximately 1.5 cm proximal from the Achilles tendon insertion (Figure 1 and Figure 2). Patient had ataxic gait and exhibited symmetrical 2+ deep tendon reflexes. His muscle strength and ankle range of motion were normal. 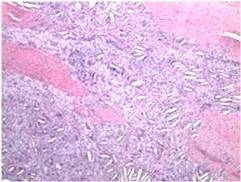 General physical examination did not disclose cutaneous xanthomas or yellowish discoloration. 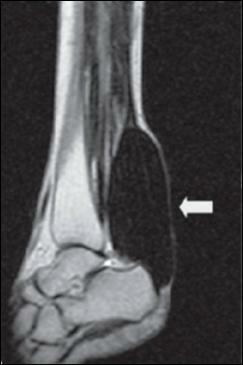 Figure 1 Bilateral Achilles tendon swelling (case 1). Figure 2 Bilateral Achilles tendon swelling (case 1). 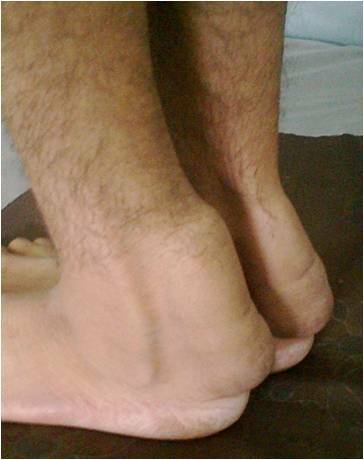 A 33-year-old male presented complaining of slowly enlarging masses overlying both distal Achilles tendons (Figure 3). They were soft and non-tender to palpation, however he did complain that closed countered shoes caused significant pain over the area. Despite being treated with nonsteroidal anti-inflammatory as well as oral steroid regimens, growth continued over the past six years. Figure 3 Bilateral Achilles tendon swelling (case 2). A neurologist had previously diagnosed multiple sclerosis on the basis of the clinical findings of neuropathy in the extremities, an ataxic gait, and plaque-like changes in the cerebral cortex on magnetic resonance imaging (Figure 4). The patient had a family history of type-2 diabetes mellitus but no other inherited disorders. No osseous pathology was noted on plain radiographs (Figure 5). Magnetic resonance images revealed a soft tissue mass on each Achilles tendon exhibiting a heterogeneous signal (Figure 6). Biopsy was done and tissue was examined under light microscopy. Fatty yellow deposits were seen infiltrating the tendinous fibers. Innumerable foamy macrophages were visualized with cleft-like spaces consistent with dissolved cholesterol secondary to cellular processing under light microscopy (Figure 7). 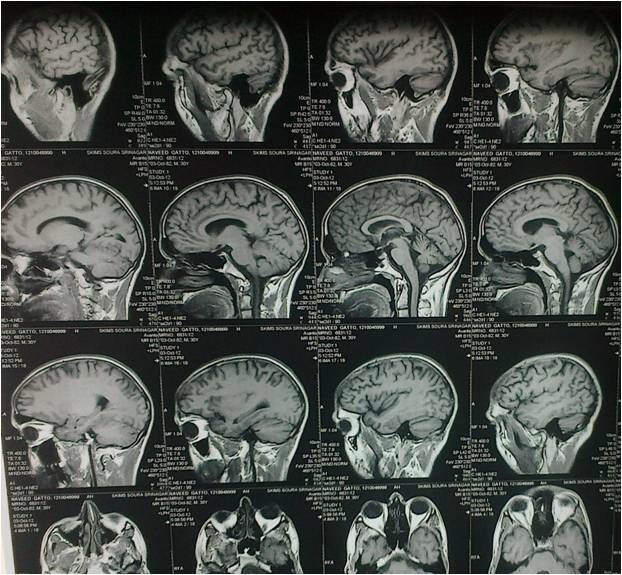 Figure 4 Brain MRI (case 2). 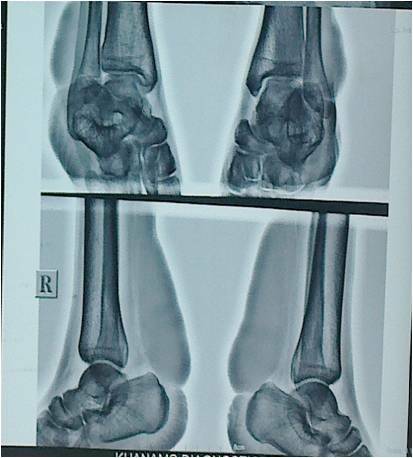 Figure 5 Anteroposterior and lateral radiographs and ankle showing bilateral soft tissue swelling without bony abnormality. Blood investigations revealed a normal complete hemogram. Liver enzymes and a lipid panel found no abnormalities except for an elevated cholestanol level of 25.8 ug/mL (normal value is 4.2 +/- 1.2 ug/mL). Figure 6 Magnetic resonance image revealed a soft tissue mass on each Achilles tendon exhibiting a heterogeneous signal. Figure 7 Light Microscopy image showing innumerable foamy macrophages with cleft-like spaces (Stain, hematoxylin and eosin, original magnification ×200). The patient was started on bile acid replacement therapy with chenodeoxycholic acid and atorvastatin. There is no further progression of swellings after treatment. There was no improvement of neurological dysfunction as seen clinically after treatment. Cerebrotendinous xanthomatosis was first described in 1937 by Van Bogaert and colleagues and has since been characterized clinically, biochemically, and genetically . In 1968, Menkes et al described the accumulation of cholestanol, the primary metabolite found in elevated concentrations in cerebrotendinous xanthomatosis, in tissues of the CNS . In 1971, Salen found that chenodeoxycholic acid (CDCA), an important bile acid, was virtually absent in patients with clinical symptoms of the disease . This led to successful trials of therapy with CDCA replacement by Salen and colleagues in 1971 . In 1980, defects in mitochondrial 27-hydroxylase were implicated in the biochemical pathophysiology of the disease by Oftebro et al . In 1991, mutations in the gene CYP27A1 were discovered as causative [8-10]. Typically, untreated cerebrotendinous xanthomatosis follows a progressive course. Chronic, sometimes intractable diarrhea occurs, with onset typically in infancy. The diarrhea continues through adulthood if left untreated . This typical presentation was not seen in our cases. Juvenile cataracts may be a presenting sign as was seen in one of our cases but the patient was not evaluated properly for the cause leading to delayed diagnosis . Xanthomas are rarely seen before age 20 years, as was in our cases, although an exaggerated phenotype may be observed in patients with heterozygous familial hypercholesterolemia and cerebrotendinous xanthomatosis . They are usually found on the Achilles tendon but may also be found on the patella, elbow, hand, and neck tendons. They have also been reported on the parenchyma of the lungs and brain, as well as in the bones. Cerebrotendinous xanthomatosis is classically characterized by (1) bilateral Achilles tendon xanthoma; (2) bilateral cataract formation; and (3) progressive neurological dysfunction with mainly pyramidal tract signs, cerebellar ataxia, and cognitive impairment. Other orthopaedic manifestations of cerebrotendinous xanthomatosis include osteoporosis with an increased risk of fracture [14-16] and peripheral neuropathy  with secondary neuropathic deformity and/or ulceration of the feet [18,19]. The diagnosis of CTX is mostly clinical as most biochemical parameters are normal. Diagnosis depends on elevated serum cholestanol levels. MRI shows evidence of cerebral and cerebellar atrophy. T2-weighted image may show focal or diffuse high signal intensities in vertebral and cerebellar white matter. Dentate nuclei could be hyperintense on FLAIR images . More recently, molecular biological techniques have been developed to assist in the diagnosis of cerebrotendinous xanthomatosis in asymptomatic homozygote family members of symptomatic patients. Heterozygotes can also be identified in these families, which is important for genetic counseling and prenatal diagnosis . The differential diagnosis for a patient presenting with xanthomas of Achilles tendon and other tendons includes familial hypercholesterolemia and sitosterolemia . Patients have accelerated atherosclerosis with tendon xanthomas, but absence of neurological symptoms and diarrhea differentiates them from CTX. Xanthomatous Achilles tendon deposits have been reported to regress with chenodeoxycholic acid therapy [23-26]. Early diagnosis of CTX is essential and key to the treatment as pharmacological management with CDCA and HMG COA reductase inhibitors (Simvastatin) has shown to slow or even reverse the progression of disease [23-24]. Patients with childhood cataract should be thoroughly screened for this problem. Medical therapy, therefore, should be instituted at the time of diagnosis, and family members should be screened for subclinical disease. The benefits of genetic testing should be given to asymptomatic subjects for the early diagnosis of this rare disease. 2. Bjorken I, Boberg KM, Leitersdoef E. Inborn errors in bile acid biosynthesis and storage of sterols other than cholesterol. In: Scriver CR, Beaudet AL, editors. The metabolic and molecular bases of inherited disease. 8th ed. New York: McGraw-Hill; 2001. p 2970-8. 3. Van Bogaert L, Scherer HJ, Epstein E. Une forme cerebrale de la cholesterinose generalisee [dissertation/master’s thesis]. Paris: Masson et Cie. 1937. 4. Menkes JH, Schimschock JR, Swanson PD. Cerebrotendinous xanthomatosis. The storage of cholestanol within the nervous system. Arch Neurol. 1968;19 (1): 47-53. [Pubmed].